Propolis is a complex mixture of resinous material collected by bees from tree branches, bushes and leaves and transported to the beehive, where secretions, wax and pollen are added. Honeybees use this mixture with mechanical and biological purposes, to repair the hive, moisture management and to prevent the entrance of intruders1. The chemical composition of propolis depends on the botanical source around the apiary but also on the geographical and climatic conditions, with bees preferring specific resin sources. In temperate regions, such as Portugal, the main botanical sources of the resin are poplar, gum rockrose, oak, willow and acacia2. This research outlines the study of how the origin of honeybees can influence the quality of propolis, comparing its physicochemical parameters. Honeybees used on this assay came from two distinct regions of Portugal, from the south (Vila-do-Bispo) and north (Bragança). Propolis production was carried out in two apiaries geographically distinct, Bragança and Vila-do-Bispo and honeybees from the two regions were established in both sites. The results showed variability between the propolis collected in the apiaries, observing a greater content on wax and ashes in the apiary samples from the south. As regards to the phenolic composition, the content of total phenol and flavonoids was higher on the samples from the north side. In respect to the impact of the geographical origin of honeybees, it is found that the physical parameters and the phenolic characteristics are similar within the same apiary and no significant differences were observed considering the origin of honeybees. 1. Bankova VS, De Castro SL, Marcucci MC (2000) Propolis: recent advances in chemistry and plant origin. Apidologie 31: 3-15. 2. Falcão SI, Tomás A, Vale N, Gomes P, Freire C, Vilas-Boas M (2013) Phenolic quantification and botanical origin of Portuguese propolis. Industrial Crops and Products 396: 887-897. ISNAD CAHANGO, Gomes da Silva , FALCÃO, Soraia I. , VILAS-BOAS, Miguel . "The Impact of Honeybee Origin on the Quality of Propolis". 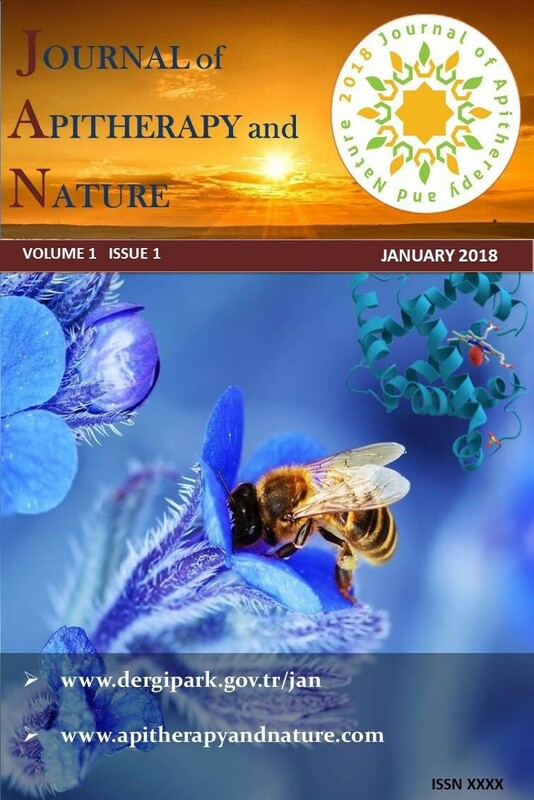 Journal of Apitherapy and Nature 1 / 3 (December 2018): 75-75.